As the world commemorated the Holocaust Tuesday, a small village in the West Bank held a surprising exhibit memorializing the most tragic event in modern Jewish history. 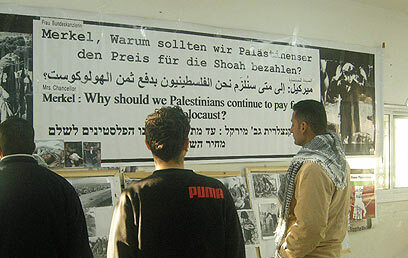 Naalin, a village that has become the symbol for the Palestinians' battle against Israel's construction of a separation fence in the West Bank, erected a display of photographs purchased from Yad Vashem Holocaust Museum and invited the public to learn more about the persecution of the Jews. Mohammad Amira, a member of the village's Land Defense Committee, said hundreds of people visited the exhibit by early afternoon. He said many had praised the initiative. "People are surprised at what they see here; there are people who are seeing images of the suffering in the Holocaust for the first time. There are people who didn't know anything about Jewish history," Amira said. Regarding the decision to present the exhibit to residents of Naalin, many of who have been harmed by the construction of the separation fence, Amira said, "We thought the public should understand the pain and suffering the Nazis caused the Jews. "Unfortunately, we are paying the price for the immense pain suffered by the Jews during the Holocaust. There is no comparison between our suffering and that of the Jewish people in the Holocaust, but everyone should understand that we are suffering too, as a result of what the Germans did to the Jews." Khaled Mahmid, who heads the Arab Institute for Holocaust Research and Education in Nazareth, said he believes the Arabs "must understand the Holocaust – the power and strength that the Jews' pain has." He added, "All violence Palestinians perform on the Israelis is not effective, causes suffering, and summons Holocaust anxiety among the Jews." "The Holocaust," Mahmid said, "was a horrible and methodical murder of six million innocents, which affects all of the citizens of Israel even today. The Palestinians need to understand that the Jews have a defense mechanism deriving from the horrid murder in the Holocaust." He said the two-state solution would only have a chance to succeed if the Palestinians made an effort to understand this "profound pain", and relinquished all acts of violence "that stirs existential anxiety in the Jews." Mahmid added that the violence exhibited by both sides is a direct result of the Holocaust. Regarding the exhibit Mahmid said, "The Koran orders us to acknowledge the Holocaust and understand it. The Jews must remember that many of them were saved during the Holocaust thanks to their brothers in the Arab lands. We must overcome Hitler's affects together." See all talkbacks "Naalin holds Holocaust exhibit"